I admit I am having loads of fun with blogging that sometimes I completely forget that I am bored (lol). I do thank Genejosh for this award. It is sweet of her to include me on the list. Carver's Sight or is that Site - You want to be thrilled by nature's wonders? This is the site to visit. The posts never cease to amaze me! 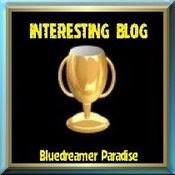 You could have guessed by now that these blogs I mentioned are more than just interesting. They are also full of things to learn about life. Congrats on the award. You certainly deserve it. I have enjoyed visiting your site. Thank you so much for mentioning me for the award too. I appreciate it. To Carver, it's always a pleasure to visit your blog! Nice that you think on me !! Congratulations ... and thanks for the links to others. I'll check them out as time permits. You DO have an interesting blog! My dog is now a cat! What is in no. 8?